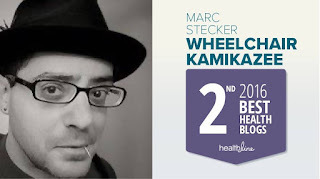 Wheelchair Kamikaze: WK Takes 2nd Place in "Best Health Blogs" Contest! WK Takes 2nd Place in "Best Health Blogs" Contest! Healthline has generously awarded Wheelchair Kamikaze $500 for its second-place finish. I’d like to donate this prize money to a worthy MS nonprofit, and I’d like Wheelchair Kamikaze readers to pick which organization should get the big bucks. We’ll do this via an online vote, much the way Healthline’s contest winners were chosen. I’ve taken the liberty to nominate four worthy organizations from which to choose. Here’s some brief background on the chosen organizations to help inform your vote. I’ve arranged the candidates in alphabetical order. The Accelerated Cure Project (click here) – The ACP is the organization administering the iConquerMS project (click here), a patient-centric research project in which MS patients can take a personal stake in advancing the cause of MS research by completing a series of online questionnaires, suggesting research topics of importance to them, and providing their feedback on research studies. By “crowdsourcing” a massive amount of data supplied by MS patients themselves, iConquerMS is compiling an unprecedented database on all aspects of MS that is open to researchers worldwide. This huge pool of information should reveal trends and insights into and about the disease that otherwise would have been missed by looking at smaller pools of data. I strongly encourage all readers to visit the iConquerMS website to sign up and begin participating in this tremendously important project. Your information has power, and together we can conquer MS. (Full disclosure: I am a member of the iConquerMS engagement committee). The Buffalo Neuroimaging Analysis Center (click here) – BNAC is a research organization devoted to shedding light on the mysteries of multiple sclerosis and other neurologic diseases through the use of innovative imaging techniques and advanced analytic tools. The group did some of the first rigorous scientific research on CCSVI when Dr. Zamboni’s vascular theory of MS first made headlines, producing findings that cast some doubt on the causative role of venous abnormalities in MS. Their research has expanded to include the role that vascular abnormalities might play in exacerbating a wide range of neurological disorders. Lead researcher Dr. Robert Zavidanov directs a team of medical researchers and scientists of a variety of disciplines, who, among many other projects, have probed the role that gray matter lesions and inflammation of the tissues that surround the central nervous system play in the MS disease process. BNAC has pioneered many revolutionary imaging techniques. Their work promises to change in a fundamental way our understanding of Multiple Sclerosis. (Full disclosure: I’m on the patient advisory board of BNAC). The Multiple Sclerosis Association of America (click here) – The MSAA provides vital services and support to MS patients throughout the United States. Programs include a Helpline with trained specialists; award-winning educational videos and publications, including MSAA’s magazine, The Motivator; safety and mobility equipment distribution; cooling accessories for heat-sensitive individuals; educational programs held across the country; and Lending Library among other services. For MS patients in financial need, the Association provides assistive equipment and cooling garments free of charge, as well as financial assistance for those who cannot afford to get MRIs. The scope of services and information provided by the Multiple Sclerosis Association of America is truly astounding, and even includes a smart phone app that helps patients manage their MS. Their website is a terrific resource for information on all things MS. I encourage all Wheelchair Kamikaze readers to visit the MSAA website and poke around, it’s a veritable treasure trove of information and vital services. The Tisch MS Research Center of New York (click here) – The Tisch Center is a worldwide leader in cutting-edge multiple sclerosis research, and is currently in preparations to begin the first FDA approved Phase 2 regenerative stem cell trial in MS patients ever conducted, expected to get started this June. The Center is building the largest stem cell research laboratory in the world, and its staff of world-class researchers has developed proprietary methodologies that transform raw mesenchymal stem cells into cells specific to the central nervous system, which should prove to be much more capable of repairing the damage done by MS than the raw cells themselves. Under the guidance of Dr. Saud Sadiq, the Tisch center is involved in a wide variety of transformative MS research projects, from identifying new disease biomarkers to understanding the mechanisms behind disease progression. The Tisch MS Research Center is totally devoted to finding the cure for Multiple Sclerosis, which is of course the ultimate desire of every MS patient and all those who love them. (Full disclosure: Dr. Sadiq is my personal neurologist). Congratulations Mark. All the best to you and a speedy replacement of your faulty roof. Congratulations, Mark. I have read and reread many of your posts. I have come back to "I miss me" many times. Keep posting! Your work is very moving. Way to go, Marc. I voted early and often, a trick I learned about living in Chicago some decades ago. I also voted in your giveaway contest. It's always good to hear about some of the forerunners in the research department. Congratulations Marc! You should have gotten first place but I couldn't remember to vote every day. Your blog is outstanding! Congratulations! And stay warm in NYC! Some of the best writing, on any topic, anywhere. I really appreciate it. Congrats. I was aware of the Tisch MS Center, but I wasn't aware that MS center is building the largest stem cell research laboratory in the world. That awesome and amazing. Congratulations on having your hard work and grand efforts recognized! We appreciate you. Congratulations and thanks for doing what only you can do so very well. Awesome job Marc! It looks like Tisch MS Research Center is going to win easily which isn't surprising. What MS'er doesn't want neuroregeneration and soon? Until then, keep on fighting the good fight. You're a source of laughter, inspiration, and knowledge to many of us MS'ers so I would like to thank you for taking us all on this journey through hell with you. Congratulation on your win Marc! Your posts are outstanding. Continue the great job. I think that Tisch MS Research Center of New York is a great place to donate. My husband is the patient there. Your BLOG is a great resource and it's no wonder you received your award. Thanks Marc. Also I’m curious to find out what blog system you have been working with? I’m experiencing some small security problems with my latest blog and I would like to find something more safe. Do you have any suggestions?